But at least I have lots of help. Oh I’m not looking forward to any of that! We actually looked at a house in our street tonight and I thought one of the major upsides would be not having to pack. I could just walk everything down the road!! Well, that would be easier! You and June Buggie are a big help. I’m sure your human would be totally inept if she didn’t have your help. At least I don’t have to pack everything this time. But it’s not a huge consolation. Last time you’ve been moving, you said you like it. ^^ See now what I mean? No matter how much you can take with you, there’s always something missing. Things get damaged or disappear miraculously. I’d like to get rid of some of this stuff…. but I feel like I’ll “need” it. Thing is if you leave something behind you might miss it a year later and even forget you’ve thrown it away. And search it until you remember. Happened to me when I moved from Germany to France. At least we’re in good company. I wish I could help you with the move – moving it’s an annoying thingy. I wish you all the luck for the move. Not a fan of moving. But with all your help it should go smoothly. Lol I’ve been going through the same process here – including those pesky little details. Good luck with it all! I don’t mind moving. I think of it as a chance to re start. But then again I’m an army brat so moving was a part of life. Thankfully my cats never chewed the boxes. Good luck on your move. Next time you move, I’ll send June Buggie to help! But Rumpy all of you ARE helping!! If you stay out of the way and don’t trip her you’ll be a huge help! *whispers* But have a talk with June Buggie so the box scratching and biting stops. You don’t want Mom missing dinner times and treat times because the time is spent repacking!! That would be PAWFUL!! I feel your pain. Last March I had to pack up and move from California to Pennsylvania. I drove across country with two cats in the back seat. Maxwell howled the entire 3 thousand miles! I haven’t moved in 22 years, but when I do a show or festival I pack and move the equivalent of a 10×10 room complete with fixtures, walls and roof, and I hate that too. I love being at the festival, I just hate packing boxes and packing the car and unpacking and repacking….Good luck with all your help! That sounds worse than packing for a trip! LOL! Yeah. No help at all! Sitting around with everything is packed is also difficult. Fretting happens. With helpers like that…. You’re on your own! we are moving too. I love your pic of the piles of boxes. 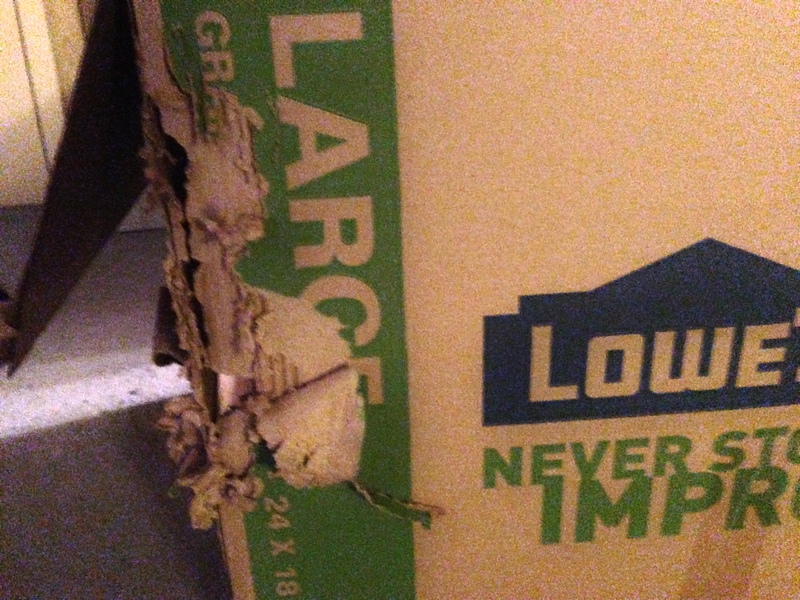 Instead of “Never stop improving” Lowe’s should make the packing boxes say “Never stop packing” because that’s what it feels like! Hahaha. Great job with helping, Rumpy! Good luck with the move. We hope it goes smoothly! don’t envy you one bit. Moving is the worst!! Sending our best wishes! Thanks Kevin! I think we’re gonna like it as much as June Buggie likes that fish you sent him! And that’s a BIG like! woo woo woo! I think Rumpy will help you pack his cookies. He’ll make if even easier because he’ll eat them. A possibility: My sister and brother-in-law moved from a 4 bedroom home, with dining room, finished basement, and a garage that never saw a car, only storage boxes from their other move, to a much smaller 3 bedroom apartment. There are mpre than 10 boxes sitting in their storage room, never opened, There are things you’ll pack and never need and never miss. I don’t envy you. Good Luck. Ooog, moving sux. I like the idea of donating anything you haven’t used in 6 months or a year so you don’t have to keep lugging it around or finding room for it.Good luck with the move! Yuck, hate packing and unpacking with a passion – but as long as you have your trusty helper at your side…wait, is he taking a nap?!!! 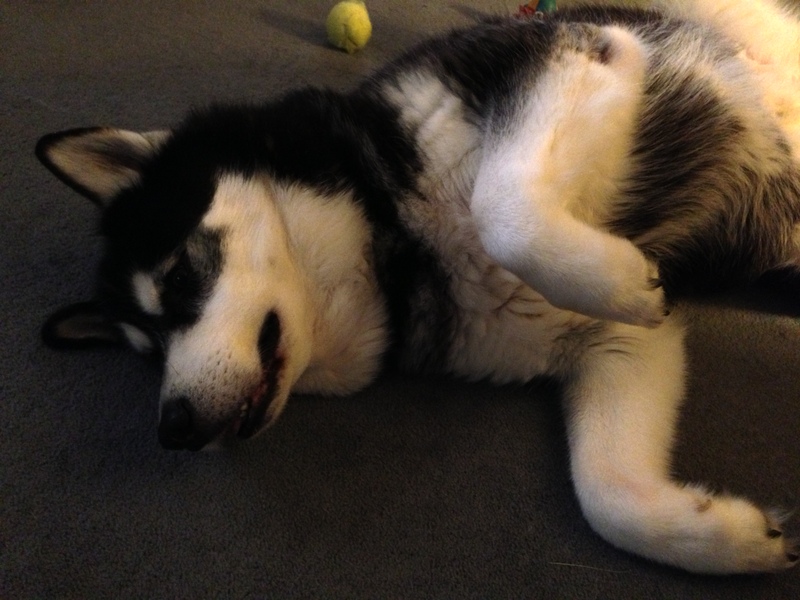 Don’t overdo it Rumpy – take time to rest! 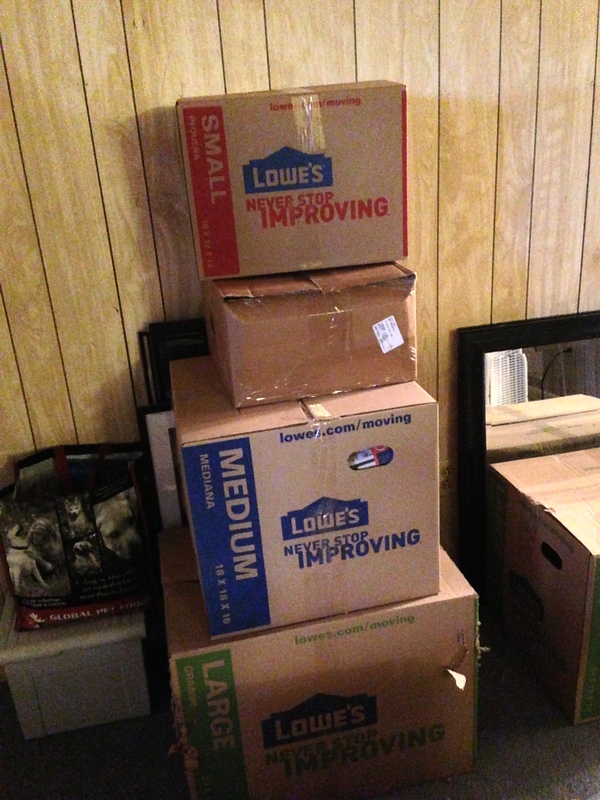 2 words – moving sux!